Driveway Paving Services Vancouver - Get Free Estimation!! The paving of a new driveway is not only a significant financial investment, but it is also an important step towards building the framework of a driveway - commercial or industrial. It is one of the first things people will see and and at Richmond Blacktop, we always deliver a high standard of service to make sure the end result is long lasting, aesthetically pleasing and an investment rather than an expense. Asphalt paving is amongst one of the most economical choices a property owner can make when it comes to paving their driveway. Asphalt is flexible, adapts to weather changes swiftly and easily and can make a huge impact when it comes to increasing the property value of your home. 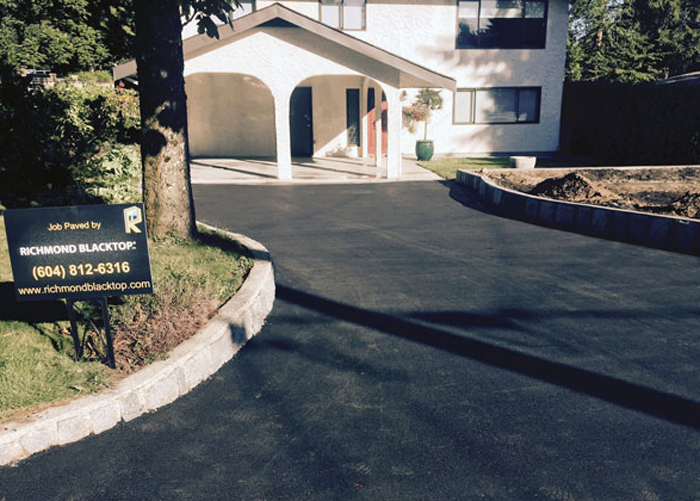 Richmond Blacktop offers a wide range of driveway paving services ranging from purely cosmetic patching, to structural work like full removal and replacement. Should you need sealcoating to add a protective barrier over the asphalt, we offer the highest quality materials that will aid in ensuring the life of the asphalt lasts a long time. Whether you want the driveway of your home paved to keep your kids safe, or the driveway of your industrial property to make deliveries and projects smooth and fuss free, we will ensure you are fully satisfied with the end result. We only use the most well maintained equipment to complete all of our projects, along with materials that are of utmost quality and reliability. Our experts will meet with you to evaluate the site, choose the best option for your project and walk you through the procedures we will take in order to achieve the desired result. Visit our Contact Us page to send us a message with your questions and comments and get a free estimate! If you have already worked with us, be sure to head over to our Testimonials page and leave us a comment describing your experience! We welcome constructive criticism so we can work hard towards serving you better during our next collaboration. We will make sure every project is uniquely customized based on the needs of the client, to ensure a final product that you will be proud to show off.